There is without a doubt a pizza giant that reigns supreme in Madison and that is Ian’s Pizza. They have become a Madison staple with popular favorites such as the mac n cheese pizza and also offer vegan options. Though I must admit that they serve good food, I can’t say that it’s the best option on campus for the cheesy treat. 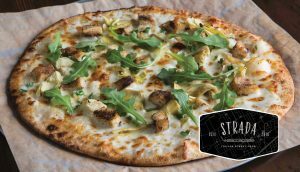 If you would agree that $50 is an absurd price for the amount of pizza shown above (the price actually paid), then you may turn your interest to a much more affordable pizza alternative: Strata located in Memorial Union. While Strata may not have the same local allure as Ian’s, it certainly is a lot less expensive. For a custom pizza with 6 toppings and a drink, the total comes out to around only $9. The size is a personal pizza that comes with 8 slices. Though this may not sound like much, I can say from experience that I have never been able to finish a pizza from this restaurant in one sitting. Not only is this pizza filling at a reasonable price, it is also completely customizable. 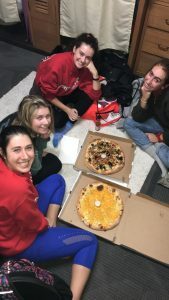 They have many toppings to choose from ranging from various cheeses, to different meats, to assorted vegetables, as well as several sauce choices. 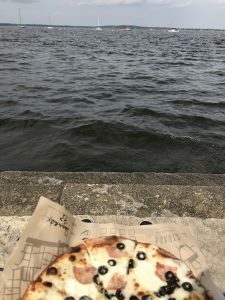 My go-to and recommendation is a pizza with white sauce and garlic oil drizzle, shredded mozzarella, fresh mozzarella, double ham, black olive, and parmesan cheese, and is best enjoyed on the terrace by the lake!